So the story starts months ago with a multi-author collection I put together for Valentine’s Day. As that collection was ending, another author I had “met” through that set (Chautona Havig) mentioned that it would be fun to do another set of new books. And that got me thinking. I really don’t do well if someone says something along the lines, “Do you have an idea for _____?” If I don’t, them my mind won’t let me rest until it has come up with something. So I went to my best thinking spot. Sometimes I refer to it as my “office.” It’s where I get all of my best ideas and where I go to figure out the toughest scenes. It’s a magical place and it has never once failed me. So I was in the shower when I got the idea for a multi-author collection where each of the stories was independent but connected in some way. Specifically, the last book in the set (mine) would tie everything together while also spinning its own fabulous story. By the time I stepped out of the shower, I had the idea, the plot, the title, and my hands weren’t even (very) wrinkled. Now, I get lots of ideas for books, many of which I forget before I even manage to write them down. For this one, I kept thinking about it for several weeks before I mentioned it to anyone. I was honestly nervous about it because I knew it was big. I would have to be in charge of the set, which included a lot of legwork, financial responsibilities, coordination, and recruiting other authors. The other scary aspect was that the set would largely depend on my writing ability. With my book being the last in the set–the one that ties everything together–I knew I would have to write around the stories of multiple different authors. Needless to say, that would be a challenge. I won’t pretend that it’s been entirely easy. We’ve had some bumps along the way. The actual writing and working together was never an issue, and I really enjoyed molding my story to fit theirs. The final product is something amazing–one that I’m extremely proud of. I truly feel that from the idea, to the formatting and cover, to the specific authors and their stories–God did made all the pieces come together to make something even more than I imagined that first night I had a big idea. 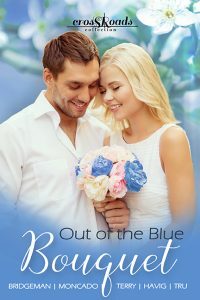 Out of the Blue Bouquet is a collection of five new books by five best-selling Christian authors. Though each story is complete and independent, you have to read the entire set to find out how they are connected. I look forward to hearing what you think of it. My heart seriously takes off every time I think of people reading a product that once only existed in my imagination. *** Out of the Blue Bouquet is available for pre-order at all retailers for 99 cents. This is only for a limited time. So if you are one of those who gets her ebooks from somewhere other than Amazon, get it quick. The book will be officially released November 7th. However, it will not be available forever. It is meant to be a limited-time collection. Eventually, it will be unpublished and the individual books will only be able to be purchased as single titles at full price. So again, get it quick! The individual retailer links are below. *** You may notice that the official title of this set includes “Collection 1.” Yes, that does mean what you think it means. I’ve had quite a few more showers since that first where I got the original idea. I am currently working on more upcoming Crossroads Collections. If you read Out of the Blue Bouquet and love it, make sure you are signed up with my newsletter. I will let subscribers know when another collection is released. Also, please leave a review and help spread the word by telling your friends. Reviews help tremendously, and I still believe that word of mouth is the best compliment and most effective marketing tool! Please note, some links on this page may be affiliate links, which means if you purchase using the link, I may get a small commission at no additional cost to you.